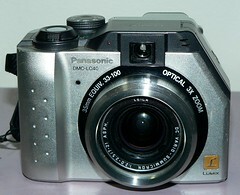 Panasonic K. K. (was: Matsushita Electric Industrial) is a Japanese company that uses the brand name Panasonic for its electronic devices, including digital cameras, in the past also analogue cameras. 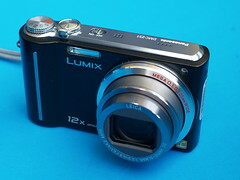 The brand Lumix is also used. 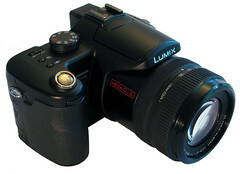 Many Lumix cameras are similar to more expensive Leica digital camera models. That's because Leica and Matsushita worked closely together in the field of compact cameras and still do in the field of digital imaging. Leica allows the use of Leica lens constructions and corresponding lens type names for the Panasonic lenses of Lumix cameras. 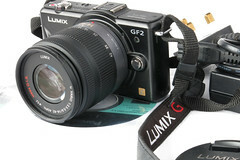 Panasonic develops and produces cameras and camera electronics for Leica. 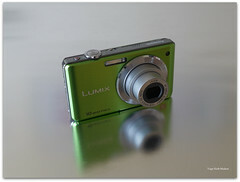 At Photokina 2008 the Panasonic Lumix DMC-G1 camera with electronic viewfinder was introduced. It was the first time that such a camera was available for a system of interchangeable lenses. 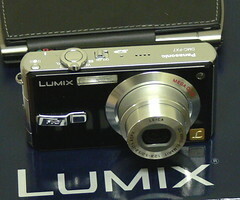 Therefore the camera has the new Micro Four-Thirds Mount and a special high-resolution color LCD viewfinder with ocular. Together with Olympus the company developed the Micro Four-Thirds Mount camera system with cameras and lenses made by both makers, and some lenses added by big lens makers like Sigma. Tough series, rugged, dust and water resistant. This page was last edited on 28 March 2019, at 03:37.